These kippers from Northumberland are smoked in the time-honoured way, slowly over oak. Cook them on the barbecue for a special summer breakfast. Preheat the grill to high. Place the tomatoes on the grill rack. Drizzle with the oil, season well and cook for 8-10 minutes. Add the kippers to the rack. Top each one with a quarter of the butter and cook for 2-3 minutes, until cooked through and piping hot. While the tomatoes are grilling, cook the eggs: melt the butter in a non-stick pan, add the beaten eggs, with a little seasoning, and cook over a medium heat, stirring all the time. Take them off the heat when they’re just softly set. Warm the potato farls in the toaster or under the grill for a couple of minutes. 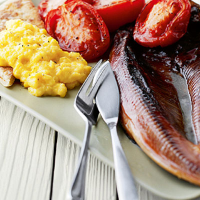 Serve the kippers with the scrambled eggs spooned over the farls, the grilled tomatoes and some lemon wedges. Craster kippers are already split open, with the backbone exposed. Remove the backbone gently using a knife, starting under the tail to ease the bone upwards towards the head. You can also cook kippers by covering them in boiling water and leaving for 10 minutes until they are piping hot. Craster kippers deserve a mug of Waitrose English Breakfast tea, a blend of fine tea with an invigorating flavour.